You want to start exercising more or to begin again but you don’t know where to start! What you need are simple tips and the motivation to start your fitness plan. Check out this blog post for 3 important keys to get you going! I was at the gym for one reason. That reason certainly wasn’t because I enjoyed using those dingy weight machines or shuffling my feet aimlessly until they were numb on the Stairmaster. Nope, the hours I spent inside those four walls were solely focused on a change I felt I just had to make- exercise was one of the ways I tried to do it. When you think of exercise or working out, what comes to mind? Do you cringe at the prospect of trying it or sigh at your failed attempts to stick with a program? While our relationship with food is rarely straightforward, our experience and presumptions about exercise can be equally as complicated. 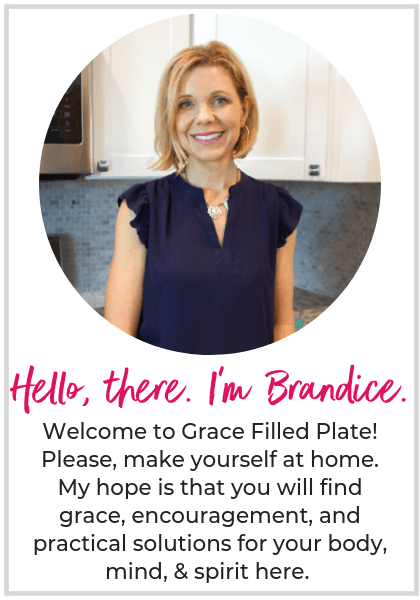 Here at Grace Filled Plate, I spend a lot of time talking about how we eat and the way we interact with food. Diets have caused us to walk down a path of all-or-nothing thinking with food– where we feel like anything less than a “perfect” is a wasted attempt. To no surprise, I have seen the same ideas arise with exercise for many of my clients. Take a moment and think about the last time you shopped for an exercise plan. What were the options available to you? Maybe some of the programs required more time, energy or resources than you had available. You may have figured out those limitations before you began (well done!) or after you struggled to adopt this new practice (and then you felt like a failure). If those expectations were more than you could reasonably handle, you probably threw in the towel altogether. Or, if you weren’t as committed as you hoped, the frustration alone was a barrier to further change. 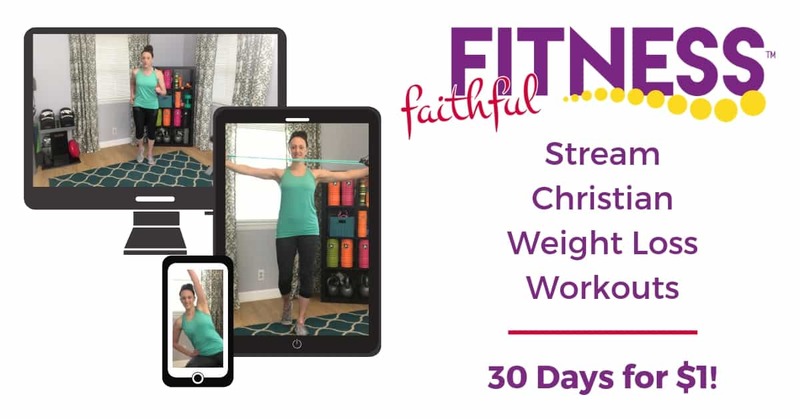 No doubt you value the outcome of an exercise plan- you want to be healthy, fit, and able to move the living room furniture around until you find the right configuration… without driving your husband up a wall. But, getting there can feel like too much. If this sounds familiar to you, my friend, you have fallen into the “diet mindset” in the realm of exercise. Don’t worry though. By identifying roadblocks, you can route new ways to get to your destination. When we get all-or-nothing about anything it is because we only see value in perfect completion. But this mindset robs us of better health, progress towards our goals, and dancing with our kids because this is how we chose to do “cardio” today. I bet you agree that this kind of thinking needs to be dealt with. DO YOU ACTUALLY WANT TO WORKOUT? But, before we can ditch black-and-white thinking, it will benefit us to think about “why” we exercise. For example, if your vision is to finish an exercise program flawlessly, then exercising “only” on 4 of the scheduled 6 days constitutes a failure. However, if your goal is to start exercising so you can be stronger in body, mind, and spirit, then 4 days (vs no days) would be an incredible thing. Why do you want to be stronger, faster, lighter? If you had greater health and endurance, what amazing things would you do? How healthy and fit would you like to be in 10 years? Daydream about your answers to these questions and don’t settle for so-so. Contemplate, envision, and allow yourself to be energized by the prospect of what incredible health can feel like for you. If I were good at guessing statistics (and I am not), I would say that 50% of people who exercise are doing so with a primary goal of weight loss in mind. When discussing exercise with clients who have weight loss goals, one of the first things we address is mentally separating exercise from losing weight. Now, this is difficult to do- especially for those who are not very overweight or unwell. But, no matter their shape or size, it’s beneficial to do. To pigeonhole exercise to weight loss is a disservice to us all. Because here’s the clincher– we can’t out-exercise our food choices. Have you ever noticed after a long run or an intense weightlifting session you are extra hungry? You may try to fight your appetite but eventually, you give in. This is normal and simply part of our body’s drive to find homeostasis- stability in its energy input and output. So, you can run-run-run, lift-lift-lift, and white-knuckle that beastly appetite all you like but sooner or later those calories burned become calories consumed. By separating exercise from weight loss, you can start to see the bigger picture of health and toy around with what types of movements you actually like to do. Isn’t it a novel idea? Now that it’s becoming clear how exercise is about more than just a calorie burn, it is time to brainstorm intentional movement you truly enjoy? I know sports aren’t for everyone (my first attempt at football ended abruptly with a ball to the face) but for even the painfully sportless like me, there are a ton of options. What exercise/workouts have you enjoyed in the past? What was your favorite way to play as a child? Did you enjoy any sport or activity in school? What is your favorite Olympic event to watch? If you could go back to your childhood, what sport would you involve yourself in? What types of activities do you encourage your kids to do? Was there any movement that stood out to you? If so, great! If not, don’t sweat it. Uncharted territory is exactly so- uncharted. We all have to start somewhere. If you feel clueless, start easy with a simple walking regime with some audiobooks to pass your time. Luke14:28 NLT But don’t begin until you count the cost. For who would begin construction of a building without first calculating the cost to see if there is enough money to finish it. Now that you have had a chance to see where your ideas about exercise may have gotten a little off track and see what you might enjoy, it is time to determine how you would like to fit consistent (or more consistent) exercise into your life. 1. Support your goals. We’re not looking for a quick fix here. This is deeper level stuff which goes beyond finicky weight loss goals. Examine your why and make sure your plan points you toward your desired end result. 2. Fit your time and resources. How much time do you have available? What is your mental capacity for change? What memberships or classes will your budget allow? Be sure to choose and review each of these items before committing to a plan. 3. Be something you LIKE to do. Let’s be real, you don’t have to “love” or even like to exercise but you will be better served to pick an activity which suits your personality and preferences. After all, we’re more likely to DO what we delight in. Alright, you’ve got some pretty juicy information to work with now. Here’s where the magic happens. By putting an action plan together you increase your chances of success exponentially. 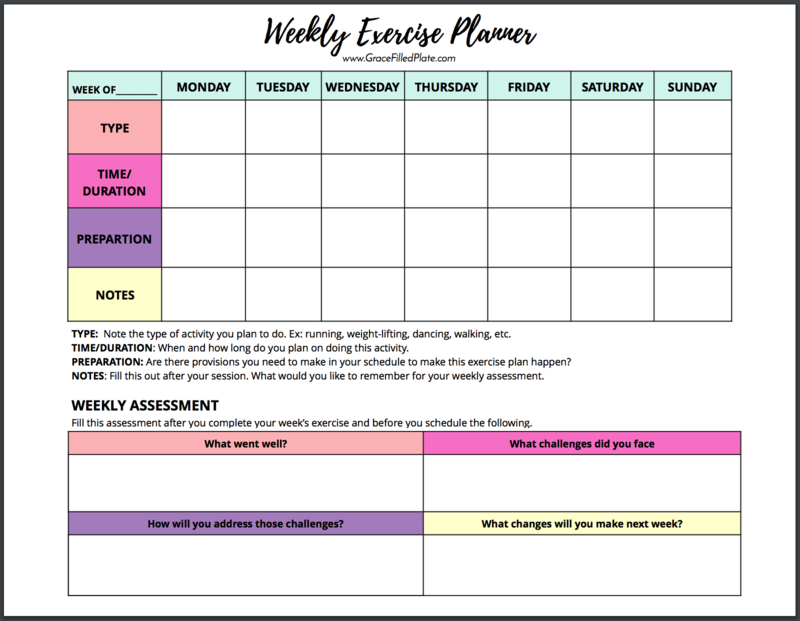 Download your FREE Weekly Exercise Planner & Assessment below. Look at your calendar and find timeslots to schedule a reasonable amount of enjoyable exercise this week. Pencil in those workouts and add them to your Weekly Exercise Planner. Then add one additional appointment at the end of the week to fill out the assessment portion of your planner. Follow this pattern until you have a flow that fits your life. Then, if you start to lose your spark, pull out these tools again. Ever wonder how your workouts would change if you were more intentional about them? This simple sheet will help you plan your workout week and then assess how your workout is working for you! These negative thinking patterns make moving our bodies for the sake of good health much harder than it needs to be. I found my own love in working out. In 2008, I worked with a personal trainer who educated me on how to workout effectively in the gym. That interaction changed those 4 gym walls from my obligation to my outlet and sealed my love of barbells, yoga balls, and dingy weight machines. If you are looking for some additional support on your journey, check out The Ultimate 12-Week Healthy Habit Goal Setting Planner. This guide will walk you through the process of choosing sustainable goals that you CAN achieve! « Has Weight Loss Become More Important Than Your Faith? I dont have the equippment for inlineskating anymore and most of them have too thight boots to fit my swollen feet inside. I do own a fitting bathing suit, however the next indoor pool (it is winter here) is 25 minutes drive by car (5€ for gas then) and 16,50 € entrance fee for 3 hours. This is the cheapest one. The next iceskating place is 1 hour drive by car away, meaning 10€ of gas per drive and back. I own my own skates that I should be able to fit in. Entrance fee differs between 2,60€ and more per hour. A riding stable where I could ride for free/taking care of the stable is 10 minutes walk from here but the horses can’t carry more than 120 pounds to 140 pounds and I have 212 currently. The next stable that has horses that can carry me is 15 minutes by car and costs 16 € per hour of riding. Currently I neither fit into my bigger riding pants nor in my bigger riding boots. My monthly income is 25 €. So how am I supposed to make this happen? One of my huge “why”s is to fit into my riding gear again. one of my others is to be able to ride for free weight-wise. It is like a vicious cycle. I love you site! Great article, keep more coming.